What are the essential practices for social emotional learning (SEL)? How can we, as educators, model SEL, measure it, and integrate it into the culture of our classroom and school? Read the tabs below for instructions to join iSEL, it’s free! What are the essential skills students need to thrive? While education focuses on cognitive skills, research shows that social and emotional skills are also essential. Increasingly, teachers see this value; in a recent study, teachers overwhelmingly agreed that social emotional skills are the missing piece to improve student outcomes and transform our schools. The question is now: how can you put this into practice in your classroom? Educators are invited to join this ground-breaking online course Introduction to Social Emotional Learning (iSEL). Collaborate with fellow teachers from all around the globe as you learn key ingredients of social emotional learning from many of the world’s top scientists and practitioners pioneering this field. Click the “Start Here” tab above for instructions on how to participate in iSEL. If you haven’t yet joined (or aren’t logged in), there’s a form below. If you’re already in, it will say so below… and you’ll be able to view the first unit of the course. As you can see on the right, there’s a menu with six “modules” (such as Why SEL, Integrating SEL, etc). Inside each module are several “units” with videos, activities, articles, and projects. In each module, you will explore all the units and and choose to go more deeply in some (catch a video, read an article, do a project… any order you like). Complete two or three brief discussion posts in the Discussion Unit in each module to move to the next module. Discussion links are also accessible from the discussion prompts within each unit. A certificate of completion will be sent to all who complete the six modules, including the feedback “quiz” final unit in each module. Presenters include Daniel Goleman, Anabel Jensen, Marc Brackett, Joshua Freedman, and many others. Additional video lectures from Maurice Elias, Mary Helen Immordino-Yang, and Dan Siegel. 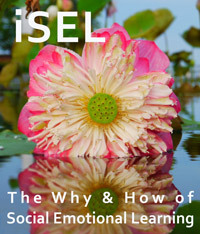 iSEL is sponsored by Six Seconds Emotional Intelligence Network and Fielding Graduate University. Six Seconds is a global network supporting people to create positive change – everywhere, all the time. How? By sharing the research and practice of emotional intelligence. We believe that if one billion people were practicing the skills of emotional intelligence, the world would be a better place. Do you agree? Join us! Fielding Graduate University is an accredited, nonprofit leader in blended education, combining face-to-face and online learning. Fielding offers doctoral, master’s, and advanced certificate programs in the fields of educational leadership, human and organizational development, and clinical and media psychology. Faculty are mentors to self-directed students who use their skills to become powerful and socially responsible leaders in their communities, workplaces, and society.